Professor Milton D. Frankenstein, DNA pioneer and radical scientist, who was dismissed from mega-City tech last year, is dead. Frankenstein who had been attempting to recreate life in his own image murdered his lab assistant and tried kill Judge Dredd. While fleeing the city via the Northways Bridge one of his freakish creations turned on him and they both plunged to their deaths. An unusual story on many fronts. The second criminal to be called Frankenstein and the second story to put a modern slant on the classic tale. In true Dredd fashion the criminal comes to his own sticky end. At the start of the second part there is a preview panel taken from later in the story. At the start of the third part the last panel of the previous Prog is reproduced as a recap. An odd occurrence. As our beloved Meg struggles to rebuild, the scourge of street gangs are taxing our depleted Judges. Making an example of the Cosmic Punks Dredd stormed their hideout outnumbered a hundred to one. After rounding up the entire gang single handily he exiled them all to the Cursed Earth for ten years. And if anyone knows the horrors of that desolate wasteland it’s Dredd. Prog 89 to 108 – The Day the Law Died! Story: The Day the Law Died! This is another of those classic epics that make Judge Dredd such a joy to read. Following straight after the mighty Cursed Earth saga this tale put Mega City One well and truly through the wringer. 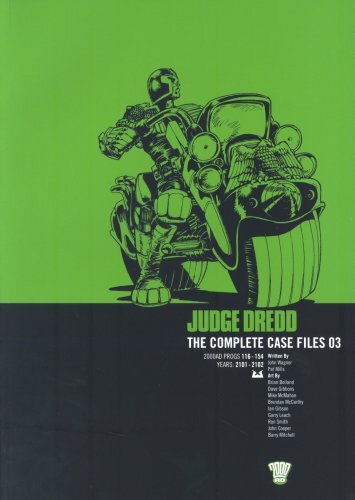 The three issues preceding this, in which Dredd is framed for murder but catches a robot duplicate of himself, are part of this story but are given separate titles. Maybe no one knew how big this story was going to get. A new chief judge takes over who happens to be a raving lunatic styled in the vein of the Roman Emperor Caligula. He is the perfect villain. Wielding authority over the whole of the city he has infinite resources at his disposal, including the Judges. If Dredd has a weakness it would be the law and turning the law against him is an emotionally brutal weapon. Forcing Dredd to rebel against the city he loves and kill his fellow judges is the ultimate test of his character. Because Chief Judge Cal is raving mad he is totally unpredictable. You can’t anticipate his methods, his goals or his strategy as it changes from moment to moment. He can’t be reasoned with as he has no reason. This also adds a wonderful surrealism to the whole storyline as a goldfish is made deputy chief judge, judges are forced to perform their duties in their pants and Cal makes many of his proclamations from the bathtub. There is a beautiful Monty Python vibe about the whole thing. It makes great use of existing characters such as Judge Giant and the one-eyed principal of the Academy of Law who is finally named as Judge Griffin. We are also introduced to another of Megacity’s classic personalities, Fergee. The tone of the piece is perfect and Dredd is constantly on the back foot waging a desperate resistance fight against overwhelming odds. But even in the midst of a life or death struggle he still makes time to stop and arrest petty criminals showing that Dredd truly is the law. There are six different artists working on the 111 page spectacular. Whilst the transition could be jarring you are so engrossed in the story and so familiar with many of the names and styles that it does not trouble you. 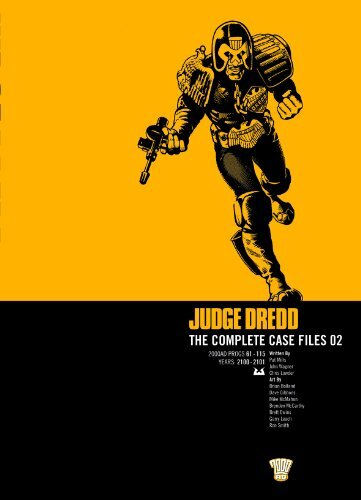 We do see the first appearance of Brett Ewins who has an ultra-clean style similar to Bolland’s which contrasts with the traditional rugged look of previous Dredd artists. There are a lot of powerful expressions, particularly from the contorted scowl of Cal as his madness twists him. One of the best villains and best storylines ever seen.